Given that two of the world’s great train journeys are now available in Australia, shouldn’t you – at least once – experience the joy of relaxed, catered, comfortable train travel with spectacular scenery thrown in for free? Travelling on the Indian Pacific or the Ghan has several advantages. Because you’re not driving a car, you can spend all your time staring out the side windows in complete safety. Moreover, you can do so with a nice beverage in one hand and some tucker in the other. Even when you’re asleep you’re making safe progress. The two major train journeys in Australia are the Indian Pacific (Sydney to Perth via Adelaide, a small matter of 4352km and three nights), and the Ghan (Adelaide to Darwin via Alice, 2979km, two nights). A third journey, the Overland, runs overnight from Melbourne to Adelaide. It’s possible to get off along the way, take your car with you, and the luggage allowances are generous. So go on. Spoil yourself just once in your life. 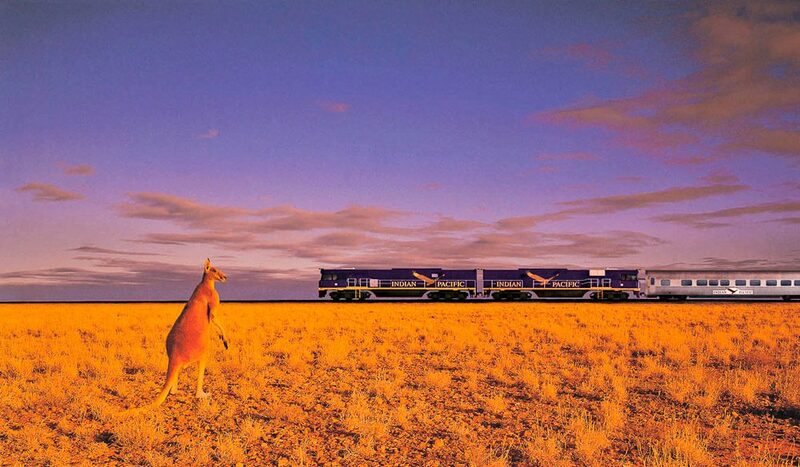 The Ghan is named after the Afghan cameleers who did so much to open up Central Australia. Camel teams supplied the telegraph, railways and pastoral stations with supplies, no matter how isolated. By 1925, camel trains had been superseded by other means of transport, and camels had become such a pest that the SA government passed the Camel Destruction Act, granting police the right to shoot trespassing or unregistered beasts. In 1935, Marree police shot 153 camels in one day. Depending on where you would like to start your train journey, Qantas and Virgin Blue have regular flights to Sydney, Perth, Adelaide, Darwin, Melbourne and Alice Springs from most major cities in Australia.